Olive Marshmallow is the newest book from Katie Saunders, and part of the debut line of books from a brand new publisher, little bee books. It may seem like there are shelves full of new baby, big sibling picture books, but during my years as a bookseller, books of this genre that I wanted to read to my own growing family or recommend to customers were few and far between. I would definitely add Saunders's Olive Marshmallow to my small list of books, especially because Saunders's illustrations are reminiscent of Lauren Child's collage-y, cartoon-y, playfully patterned style. One thing that I especially like about Saunders's Olive Marshmallow is that it is written in a way that an older two-year-old or three-year-old will understand. 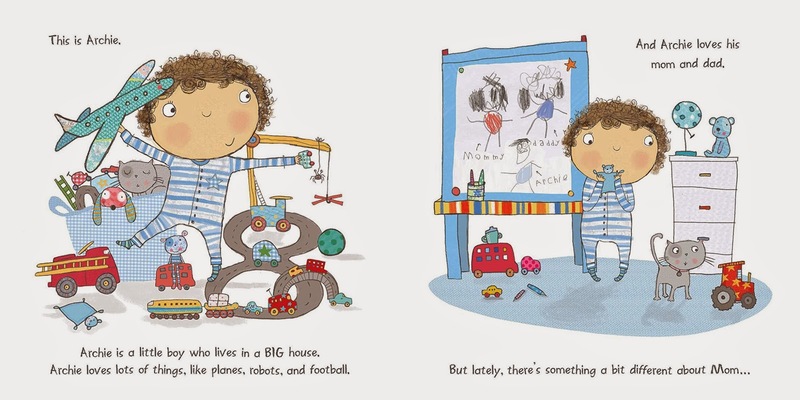 Sometimes the feelings of rivalry and jealousy before, during and after the arrival of a new baby can be too complex for a picture book. 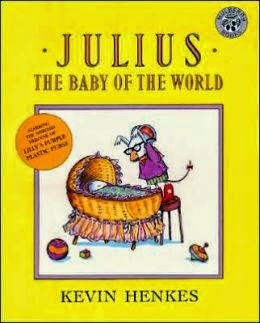 While Kevin Henkes's Julius, Baby of the World will always be my personal favorite, the length of the story and the layers of emotions that big sister Lilly experiences are more than most toddlers can sit for or comprehend. Olive Marshmallow introduces us to Archie, adorably, perfectly attired in stripy-blue-onesie-jammies. One day, Archie notices something different about Mom. She looks bigger . . . and her office is suddenly filled with lots of pink things! Then Mommy shows Archie a strange picture. 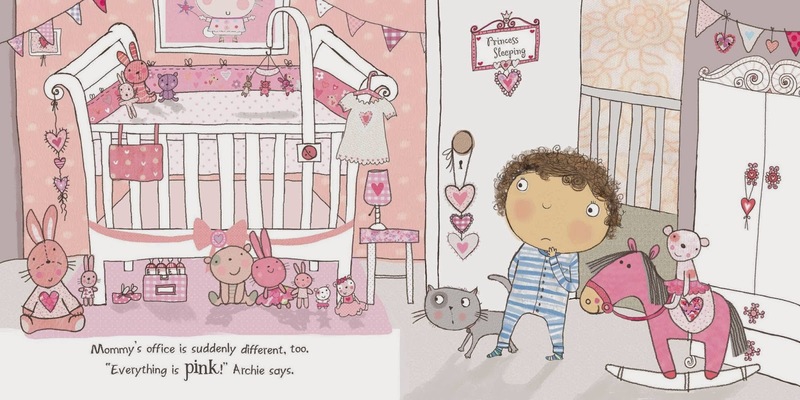 Archie isn't sure he wants a baby sister and the "fluffy, frilly VERY pink things" that seem to come with her. But, Mommy promises him a surprise as she heads off to the hospital and Archie loves surprises! In a touch that I really loved, probably because I did it for my own children, the surprise for Archie is a brand new tractor, a gift from his new sister, Olive! Archie realizes that life with Olive, called Olive Marshmallow because Archie thought she looked like one when she came home from the hospital, is not so bad. Pink and frilly is pretty okay, and twice the toys and a playmate are definitely good things. 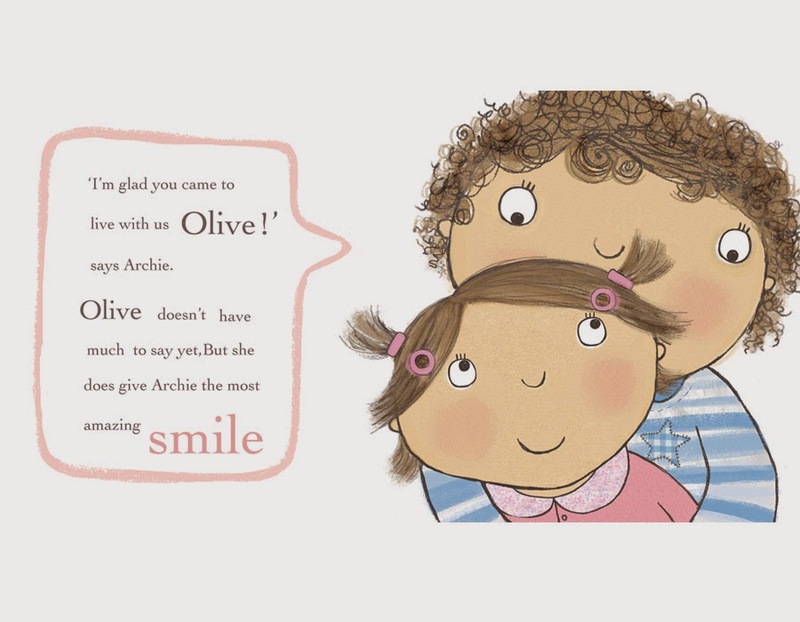 Saunders ends Olive Marshmallow with a very funny, sweet ending when Archie and Olive notice something different about Mom . . .